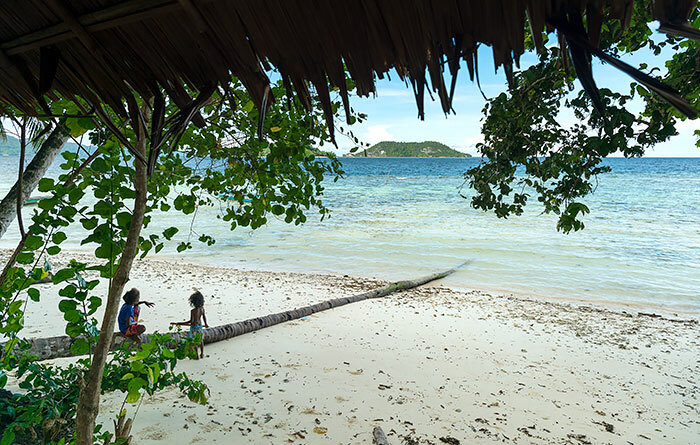 Wapen Homestay offers a quiet escape to a shady, private bay with a good house reef, a curve of sandy beach and easy access to fabulous snorkelling. 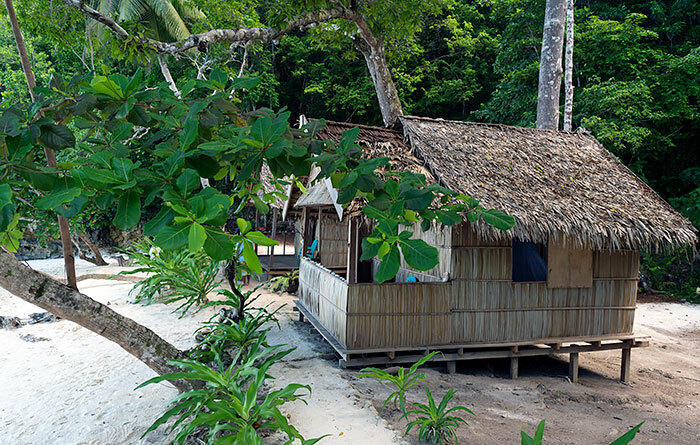 Wapen Homestay occupies a sheltered cove near Yenbeser village on Pulau Gam’s eastern shore. 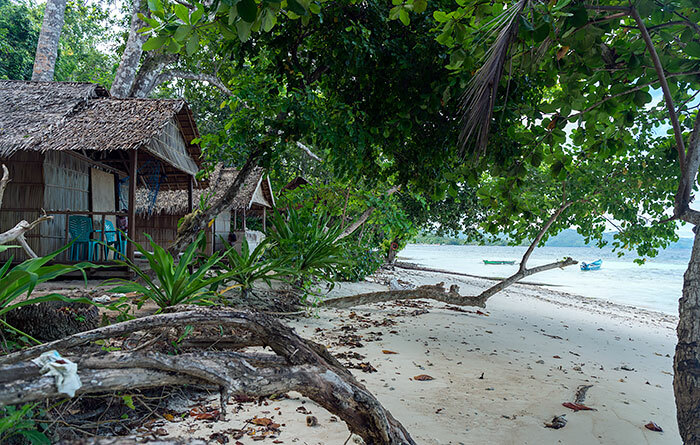 Two private bungalows are available, both of which sit in the shade of beachside trees and have ocean views to Pulau Friwen. 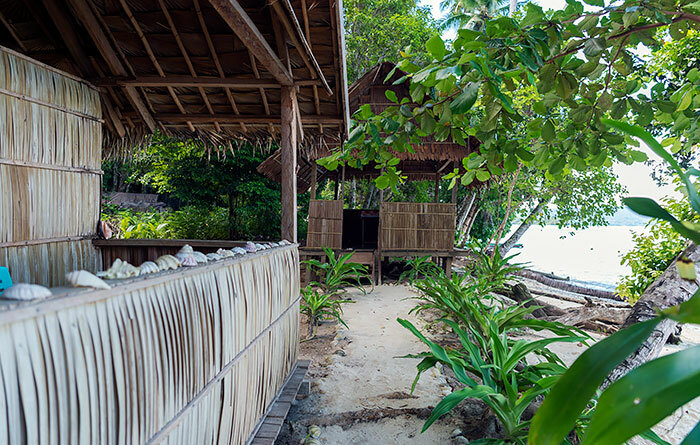 Bungalow verandahs have tables and chairs and bedrooms are equipped with mattresses on the floor with sheets, pillows, bolsters and mosquito nets. 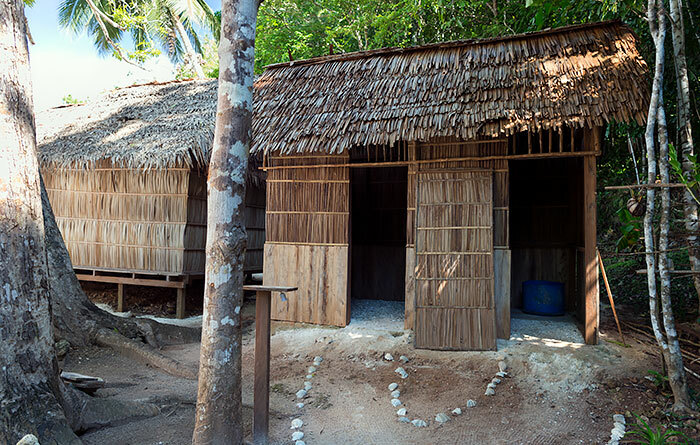 Meals at Wapen Homestay are served in a beachside dining shelter, where you’ll find drinking water and tea and coffee making supplies freely available. 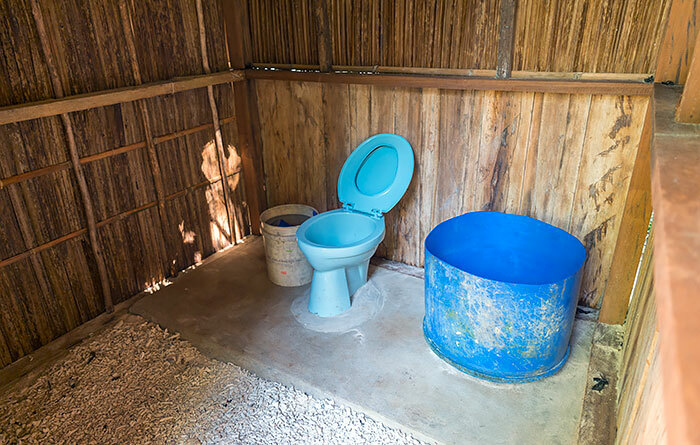 Guests share a two-room bathroom building which has bucket bathing and a western style toilet. 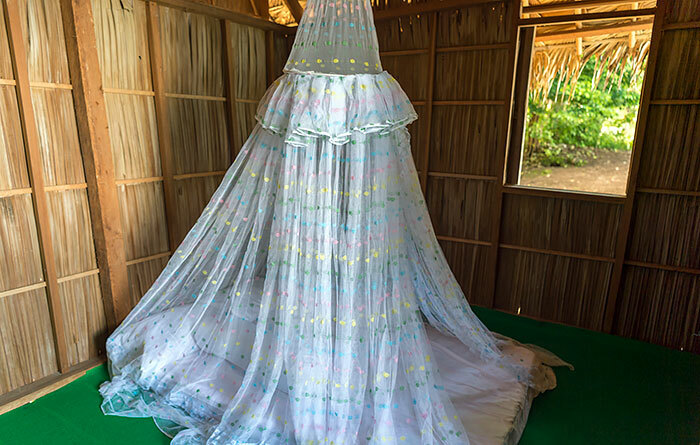 Electricity is provided by generator and is available from sunset to about midnight, and Wapen Homestay receives a good phone signal that will allow a slow data connection. 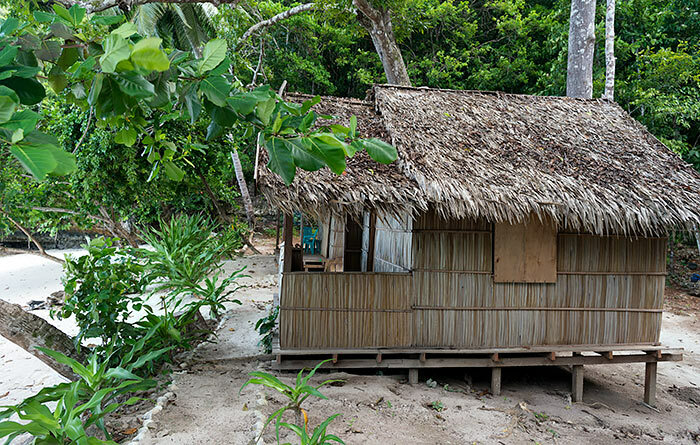 Bring any essential supplies with you, as the nearest village of Yenbeser is about a kilometre and a half away by boat. Basic supplies can be purchased in Yenbeser’s several small shops. Minimal English is spoken at Wapen Homestay, so if you don’t speak Bahasa Indonesia, bringing a phrasebook will help ease any communication difficulties. As elsewhere in Raja Ampat, it’s essential to take any inorganic waste you create (especially plastic) away with you when you leave. 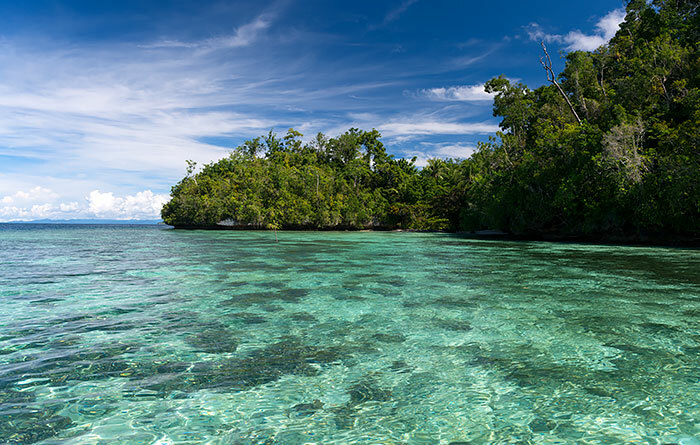 Leaving things like plastic and dead batteries at homestays will only contribute to the trashing of paradise, as effective waste recycling and disposal is not yet available in Raja Ampat. 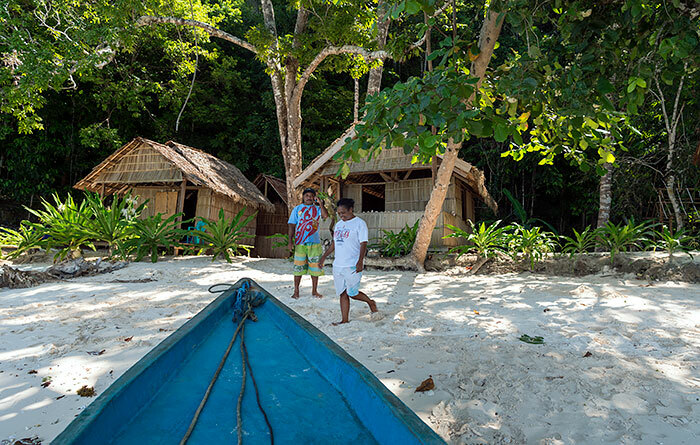 Transfers between Wapen Homestay and Waisai are by longboat than can carry up to 4 passengers and cost IDR 500,000 each way (shared by passengers). 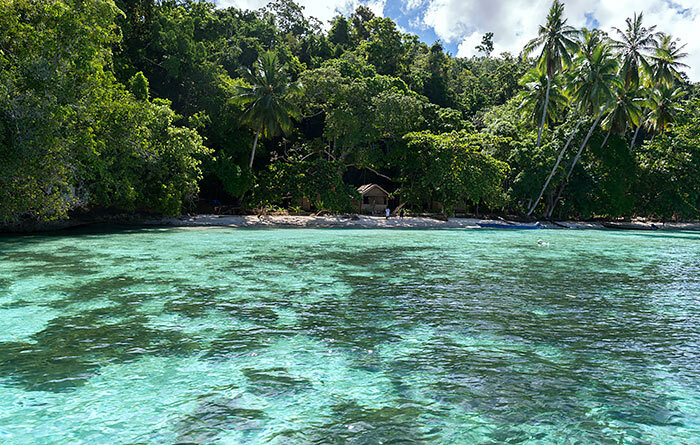 Good snorkelling can be had from the beach at Wapen Homestay (bring your own gear) and the homestay is close to the excellent snorkelling sites of Frwen, Friwen Wall and Batu Lima. Wapen can organise boat tours for snorkelling and/or sightseeing to any Dampier Strait and Kabui Bay sites you’d like to visit. Some examples are below. Prices in IDR, per trip, shared by boat passengers. We stayed for three nights from March 3rd. 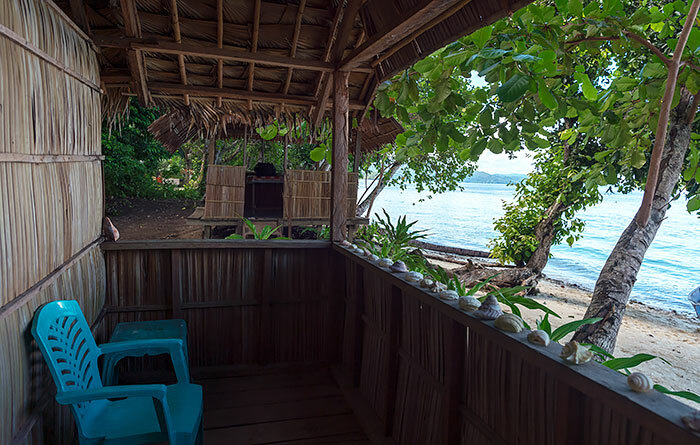 The newer of the two bungalows is very nice and has the best view from its verandah, just 3 meters from the high water mark. You look out over a row of spider lilies to the sea and the islands of Friwen. Good bedding and mats. You are under a tall mango tree and the natural forest is close on your right and just behind the mandi, which is a few meters behind the bungalow. No rats. You hear parrots and other birds close by but it is difficult to see them. The dining room also has a nice view. The food is very good and Efi is clever at preparing a variety of dishes. A delightful family. There are 5 daughters and one son, Manu, aged 14. He is a very nice and helpful boy. I expect that he will soon learn some English. No one speaks English yet and it would be difficult if you do not speak some bahasa. The house reef is excellent and the drop-off is only about 100 meters away. If you go towards the village, there are hardly any currents. Directly opposite the bungalow is particularly good for the number and variety of fish. It is the only reef in R4 where we did not see any rubbish. The beach is nice, a bit less than 100 meters long and has very find sand. 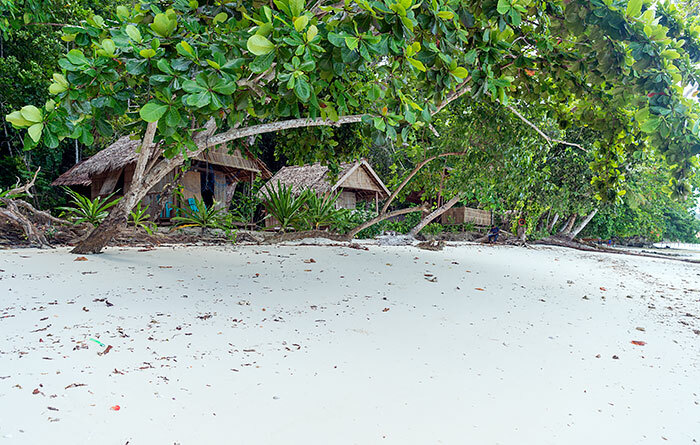 There is another homestay near the far end of the beach, which had no guests during our visit. At low tide, you can walk round to another beach and if you then follow a path southwards a short distance through the forest you come to a very nice beach. There is a larger homestay there, which was unoccupied. 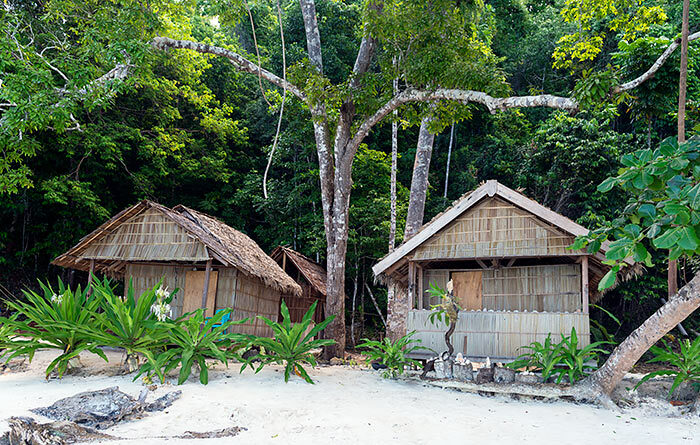 The village of Yenbeser is little more than 5 minutes away by boat. 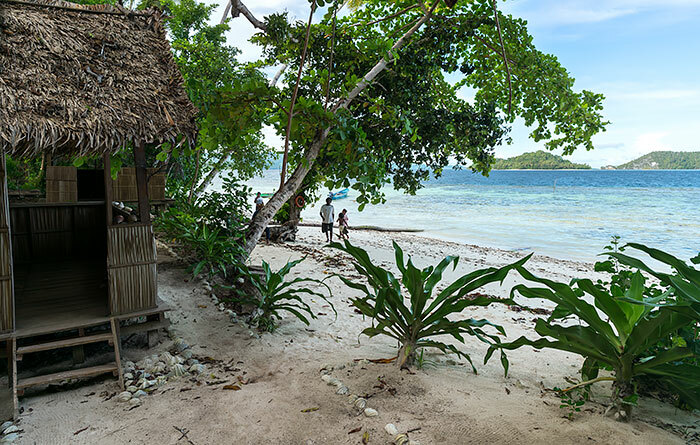 From there you can go to the lagoon beyond, at the end of which there is a 5 minute walk through the forest to see a reconstruction of the hut where Alfred Russel Wallace stayed in 1860. If you are up early enough you can also see the Red birds of paradise displaying. We were disappointed that the guide Simon Kolomsusu was away and his older brother accompanied us instead. He was not a satisfactory substitute. We were only the second visitors to stay at Wapen. Yet it has the most attractive site of all the homestays near Yenbeser and you could not ask for better service. Please go and stay! You will have the satisfaction of significantly benefitting a delightful and hard-working family. I have had a great time at Wapen Homestay! Wapen Homestay has two bungalows. During the time that we were there, we were the only guests. The homestay looks great and there is a lovely place to sit, where food and drinks are served as well. We felt immediately at home, the whole family is very kind and welcoming. They do not speak English, so make sure that you speak a few words of Bahasa Indonesia, or you have a language book to make yourself clear. The family also provides you with a dictionary on your room. From the homestay the only way of leaving is by boat. For us this was not a problem, but if you would like to do a lot of activities I would recommend doing that first (that is what we did), and then stay a few more days here to rest. We stayed for four nights and I think that two to three nights would be perfect. Fanny, the family’s daughter, speaks a few words of English and took us to the small village on the afternoon that we arrived. She showed us around there, which was very nice. The family also has contact with a boat owner, who speaks English very well. He can take you on boattrips, but as there are not a lot of people to share the boatcosts with (there can be a few in a homestay nearby) long boattrips can get very expensive. We did go to Friwen Wall, only a few hundred metres from the homestay, which I would definitely recommend. Furthermore, the food was great! The food is more than enough and you are also provided with nice snacks. There was always coffee and tea, and a few crackers or cookies available for a light snack. The food that was served was fresh and very tasteful, and we got something else to eat every time. Overall, I would recommend Wapen Homestay! Especially if you speak a bit of Bahasa, it is very nice to stay here. Make sure that you have done all the activities that you really want to do with a different homestay (although some activities can probably be arranged through Wapen as well), and get some rest at Wapen homestay. I would choose Wapen again!